Shagbark and shellbark hickory. Large trees from the US., quite fast growing once established and reaching up to 30 m (100 ft). Needs a fertile soil and sunny position. Foliage turns a rich yellow in autumn. 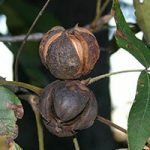 Fruits are produced in Britain in good summers: the nuts are large-walnut-sized, edible, with a very good sweet flavour, like a rich walnut; they are quite tough to crack. Also edible is the sap, tapped like maples. The timber is hard and used for fuel, handles, ladders, implements, and for smoking meats. A yellow dye is obtained from the bark. Hardy to -25°C. Grow more than one selection for cross pollination.